With just two days remaining until “Green Lantern” is in theaters, Warner Bros. has released what could be the final two featurettes before the movie hits theaters. In the first one, “Becoming a Green Lantern,” we start off with a montage of footage from the film. Ryan Reynolds then talks about how his character, Hal Jordan, is just a normal guy who doubts that he has what is needed to be a part of the intergalactic police force known as “The Corps” of Green Lanterns. We see a lot of humor from Reynolds, which is typical, but a sense of the responsibility that weighs heavily upon him also is apparent. Mark Strong, who plays Sinestro, the leader of the Green Lantern Corps, weighs in on the mind-blowing premise of a ring giving you access to outer space. We see all 3,600 Green Lanterns — which are aliens that come in all shapes and sizes and are all warriors. As Hal Jordan is the first human ever chosen to be a Green Lantern, the others are not going to take it easy on him as they test his strength and willpower to determine if he is worthy to be one of them. In the second featurette, titled “Bigger than any Superhero,” we hear Reynolds and director Martin Campbell talk about the epic and massive scale that this film is taking on. Where all previous superhero feature films have been rooted on Earth and in reality, “Green Lantern” opens up the entire universe to us and makes it accessible thanks to the power of the Green Lantern ring and Hal Jordan’s journey to discovering the power of his will and how strong he truly can be. Being able to do things technically and practically for this film and the convergence of the two together in a way that was never possible before is going to be amazing to see. Everyone involved in the movie all seem to think that this could be one of the best adaptations of a comic-book into a feature film ever. Now, while many of us are still slightly skeptical, there is no denying that the new footage and promotional materials being released recently are streets ahead of the original teaser trailer released last November that had everyone worried how the film would look. So what is your opinion? 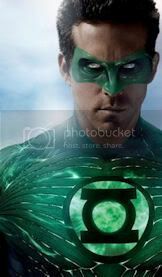 Will you be seeing “Green Lantern” in theaters when it is released or wait to see how it is received by fans and critics? Leave a comment and let us know. The movie — which also stars Blake Lively, Mark Strong, Peter Sarsgaard, Angela Bassett and the voices of Michael Clarke Duncan and Geoffrey Rush — constructs its way into theaters June 17. Critics are ripping this thing to shreds. Too bad. I still wanna see it regardless of what they have to say. I’d like to find out for myself whether it’s good or not.